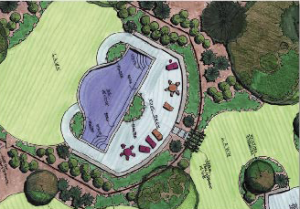 Depending upon the size and complexity of your landscape project, the installation may involve several specialized contractor trades that could include site excavators, swimming pool installers, fence contractors, plantsmen, and various other vendors and suppliers. Depending on the site, additional work may include grading and earthwork, drainage, outdoor lighting, and an automatic irrigation system. H.J. 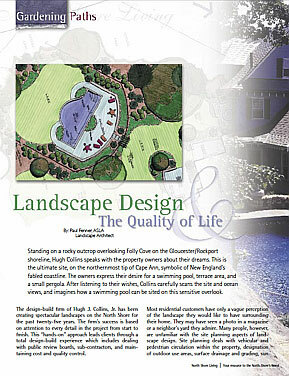 Collins & Associates (formerly Hugh J. Collins, Jr., Landscape Designer, Inc.) designs and builds residential and commercial landscape settings and structures that provide year-round delight. 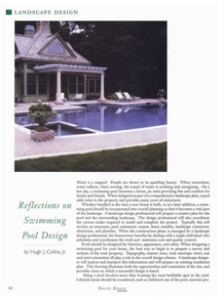 Complete services include pools, retaining walls, patios, terraces, driveways, gardens, all styles, traditional or contemporary, to suit your taste and budget.